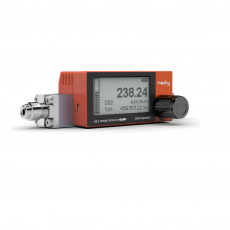 The red-y compact mass flow meters are powered with a standard AA battery. The MEMS semiconductor chip is the centerpiece of the thermal mass flow meter. Choose between a large number of standardized and normalized flow units of the Imperial, US customary and SI measuring systems (with user adjustable reference conditions).